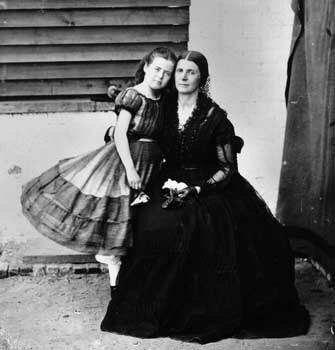 Rose O’Neal Greenhow is one of the most interesting women of the Civil War. I encourage you to read more about her. She was a spy for the Confederate Government. Here is a short story I wrote about her and her daughter. I’ve included a photo of Rose and Little Rose. Let me know what you think of the story. The nuns here taught me that a “cipher” is a dark secret. My life’s been filled with dark secrets, and most of them the world will never know, and some of them I’ll never understand. My father died not long after I was born, and I’ve no memory of him. I was only nine years old when my mother drowned in 1864. She had left England on a blockade runner, but the ship grounded on a sandbar off the coast of Virginia. Fearing capture by the Yankees, she tried to escape, but her rowboat overturned and the Confederate gold she carried dragged her to the ocean’s bottom. I still miss Mama, but I don’t cry for her like I did. I know I’m not the only child who lost her mama in the war of the South’s secession, but it doesn’t make losing mine any easier. Sometimes I dream of the day Mama and I were arrested and sent to Old Capitol Prison. I had just looked out the window. “Lincoln’s Pinkerton man is back, Mama,” I said. “He’s outside talking with two Yankee soldiers. You want me to open the door?” I heard the man knocking. “You’re going to arrest Little Rose too?” mother asked. “Information you’re intending to pass to the enemy,” he replied. Old Capitol Prison was a terrible, dilapidated place. Once it had been a grand boardinghouse where she had been courted by men like Congressman John C. Calhoun. It wasn’t grand when I saw it. I still recall the gallows I could see through the iron bars of our window and the others there with us—blockade runners, spies, and Confederate general. There were even newspaper editors from the North who had dared to criticize Lincoln or Stanton or Seward. We weren’t given much food in the five months we were there. Without the help of some of the other prisoners and people on the street who would slip us food, we would surely have starved to death. At times I was so hungry and cold that I would cry myself to sleep on that hard prison bed. I knew my mother was hungry too, but she never complained. She would just pat my back and sing softly to me until I fell asleep. She had a toughness that most mothers don’t have. One day, that Yankee photographer, Matthew Brady, came to Old Capitol Prison and photographed us. I’m told he did it because we were the most notorious Confederate prisoners there, and I guess it means something to be famous like that. Brady’s photograph is the only one I have of my mother. The photograph will tell you some things about us, but it won’t tell you of the hardships we endured there—the abusive guards, the bugs, the hunger, the cold, nor will it tell you about the cipher in my gray stocking. Mother never told me what the cipher meant, nor if that little piece of paper was what the Yankees were looking for. I had always meant to ask her about it. Years later, I stand outside the convent my sister had placed me in when Mama drowned and whispered my goodbye. I sighed and wondered what parts of me had been left in its cold stone walls, my home now for over six years. The nuns had been good to me, tutored me, cared for me, but they couldn’t take the place of my mama, the “Wild Rebel Rose.” Nor could they take away the anger and pain in my heart. My mama’s war had cheated me of my childhood and taken away my mother and sisters. I couldn’t decipher why it all had happened to me. At my sister’s house, I retired early and found myself missing Mama. I removed my scuffed shoes and carefully peeled the gray stocking off my foot, waiting for the faded cipher to fall out and float to the floor like it had every night. It didn’t. I panicked and quickly turned the stocking inside-out. I realized that the little piece of paper was gone. The cipher I never understood was lost. Just like my mother. Like my childhood. Just like the lost cause of the Confederacy. But I had kept my promise to my mama. I have never shown that piece of paper to a living soul.